The Crane is renowned for its beauty and its intricate mating rituals. From the American Great Plains to the shores of the Aegean Sea, these birds have been entangled in mythologies, folklore, and legends that stretch far into the distant past. Cranes are symbols of Hope and Prosperity. In ancient Greece, they were seen as representatives of Apollo, the Sun God, heralding the coming light and new opportunity. In Japan, the Crane is revered as a national treasure. They are symbols of Fortune, Longevity, and - given their reputation for monogamy - images of cranes are often incorporated into wedding decorations as a celebration of unity. The tradition of origami crane has been around for centuries, but became popularized shortly after WWII. A young Japanese girl, who was diagnosed with leukaemia caused by fallout from the bombing of Hiroshima, attempted to fold a thousand origami cranes as a symbol of peace and in a spiritual bid to recover. Japanese legend states that doing so would entitle a person to one wish from a blessed crane. Sadly, Sadako Sasaki died before reaching her goal, but not before her story touched the hearts of millions. Today, it has become a tradition for people to fold a thousand origami cranes as a sign of Peace, Health, and Prosperity, in keeping with Sadako's bravery and the ancient Japanese tradition. In the Christian tradition, cranes are seen as religious icons. They are symbols of Purity and Grace. Part of their image as religious icons could stem from the crane's predilection for hunting snakes. Snakes are emblems of evil and totems of the Devil, as such, any animal renowned for the skill of defeating them is seen as a representative of God. Crane Tattoos are usually exquisitely designed to play up the animal's beautiful lines and perfect outline. Although most designs are not vibrantly colourful, some artists open up their imagination think tanks and go wild with all the colors of the palate. 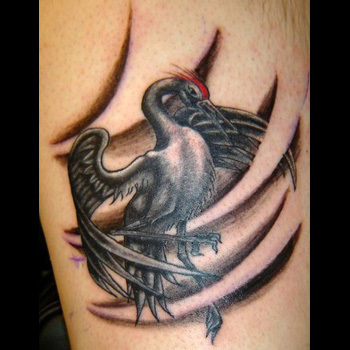 Most tattoos feature the bird in flight, soaring high in a tranquil background. Some Crane Tattoos are deliberately designed to resemble its origami counterpart, as a tip of the hat to the ancient Japanese legend. Peace, Happiness, and Longevity can also be shown as a happy Peace Frog as well as a soaring crane. Crane Tattoos symbolize purity of spirit and are great ways to express your calm nature. Creating the perfect design can be difficult. There are a number of issues to consider, including what your new tattoo will symbolize, where you will place it on your body, and whether or not it really fits your overall style, persona, and the message that you are trying to convey. If you need help, then our team of artists are ready and willing. Take advantage of our Custom Design Service and we can create a design that will be a truly a masterpiece.